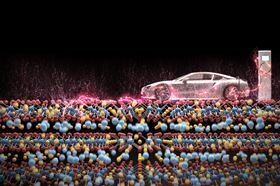 A new study investigating how the atomic structure of lithium-rich battery cathodes evolves during charging and discharging could help to increase the driving range of electric cars. Image: Stanford University/3Dgraphic. If you add more lithium to the positive electrode of a lithium-ion battery – overstuff it, in a sense – it can store much more charge in the same amount of space, theoretically powering an electric car 30% to 50% farther between charges. But these lithium-rich cathodes quickly lose voltage, and years of research have not been able to pin down why – until now. Researchers from Stanford University, two US Department of Energy national labs and the battery manufacturer Samsung looked at this problem from many angles. This allowed them to form a comprehensive picture of how the same chemical processes that give these cathodes their high capacity are also linked to changes in atomic structure that sap their performance. "This is good news," said William Gent, a Stanford University graduate student who led the study. "It gives us a promising new pathway for optimizing the voltage performance of lithium-rich cathodes by controlling the way their atomic structure evolves as a battery charges and discharges." "It is a huge deal if you can get these lithium-rich electrodes to work because they would be one of the enablers for electric cars with a much longer range," said Michael Toney, a distinguished staff scientist at SLAC National Accelerator Laboratory and a co-author of the paper. "There is enormous interest in the automotive community in developing ways to implement these, and understanding what the technological barriers are may help us solve the problems that are holding them back." The researchers report their findings in a paper in Nature Communications. They studied the cathodes with a variety of X-ray techniques at SLAC's Stanford Synchrotron Radiation Lightsource (SSRL) and Lawrence Berkeley National Laboratory's Advanced Light Source (ALS). Theorists from Berkeley Lab's Molecular Foundry, led by David Prendergast, were also involved, helping the experimenters understand what to look for and explain their results. The cathodes themselves were made by Samsung Advanced Institute of Technology using commercially relevant processes, and assembled into batteries similar to those used in electric vehicles. "This ensured that our results represented an understanding of a cutting-edge material that would be directly relevant for our industry partners," Gent said. As an ALS doctoral fellow in residence, he was involved in both the experiments and the theoretical modelling for the study. Batteries convert electrical energy to chemical energy for storage. They have three basic parts: two electrodes, the cathode and the anode, and the liquid electrolyte between them. As a lithium-ion battery charges and discharges, lithium ions shuttle back and forth between the two electrodes, where they insert themselves into the electrode materials. The more ions an electrode can absorb and release in relation to its size and weight – a factor known as capacity – the more energy it can store, and the smaller and lighter a battery can be, allowing batteries to shrink and electric cars to travel more miles between charges. "The cathode in today's lithium-ion batteries operates at only about half of its theoretical capacity, which means it should be able to last twice as long per charge," said William Chueh, an investigator with the Stanford Institute for Materials and Energy Sciences (SIMES) at SLAC. "But you can't charge it all the way full. It's like a bucket you fill with water, but then you can only pour half of the water out. This is one of the big challenges in the field right now – how do you get these cathode materials to behave up to their theoretical capacity? That's why people have been so excited about the prospect of storing a lot more energy in lithium-rich cathodes." Like today's cathodes, lithium-rich cathodes are made of layers of lithium sandwiched between layers of transition metal oxides – elements like nickel, manganese or cobalt combined with oxygen. Adding lithium to the oxide layer increases the cathode's capacity by between 30% and 50%. Previous research had shown that several things happen simultaneously when lithium-rich cathodes charge, Chueh said. Lithium ions move out of the cathode and into the anode, and some transition metal atoms move in to take their place. Meanwhile, the oxygen atoms release some of their electrons, establishing the electrical current and voltage for charging, according to Chueh. When the lithium ions and electrons return to the cathode during discharge, most of the transition metal interlopers return to their original spots, but not all of them and not right away. With each cycle, this back and forth changes the cathode's atomic structure. It's as if the bucket morphs into a smaller and slightly different bucket, Chueh added. "We knew all these phenomena were probably related, but not how," Chueh said. "Now this suite of experiments at SSRL and ALS shows the mechanism that connects them and how to control it. This is a significant technological discovery that people have not holistically understood." At SLAC's SSRL, Toney and his colleagues used a variety of X-ray methods to make a careful determination of how the cathode's atomic and chemical structure changed as the battery charged and discharged. Another important tool was soft X-ray resonant inelastic X-ray scattering (RIXS), which gleans atomic-scale information about a material's magnetic and electronic properties. An advanced RIXS system that began operation at ALS last year can scan samples much faster than before. "RIXS has mostly been used for fundamental physics," ALS scientist Wanli Yang said. "But with this new ALS system, we wanted to really open up RIXS for practical materials studies, including energy-related materials. Now that its potential for these studies has been partially demonstrated, we could easily extend RIXS to other battery materials and reveal information that was not accessible before."